Gurudev’s association with Sivagiri in Varkala in south Kerala dates to 1904. Varkala used to be known as the southern Benares. A lover of nature and places radiant with natural beauty, Narayana Guru built a hermitage on top of the Sivagiri hill and stayed there. He grew some plants around the place. That solitary hill began to attract public attention ever since Gurudev appeared there. In course of time the government granted the Sivagiri hill to Gurudev and the people gave some of the surrounding places to him as gifts. Later Sivagiri grew into the nerve centre of Sree Narayana movements. At first an elementary school was established there. A night school was also founded for the illiterate people of an untouchable caste. Lots of people came to Sivagiri to have a darshan of Gurudev. In 1908 (1083) Narayana Guru laid the foundation stone of the famous Kozhikodu Sreekandeswaram temple of north Kerala. That year in January the Theosophial society gave a rousing reception to Gurudev. In the citation given by them, Gurudev was described “a true Brahmajnani”.The same year Gurudev consecrated a deity in the Jagannath temple at Thalassery. It is worth remembering that Gurudev’s first statue was put up at Thalassery when he was alive.The architect of that bronze statue was the Italian artist Thavarly. The statue was installed at the initiative of Gurudev’s grahastha disciples such as Moorkothu Kumaran. In 1908 Gurudev founded the Kannur Sundareswaram temple. The next year he set out for Mangalapuram. The campaign for social reform was progressing all this time. In 1911 Gurudev travelled to many places in south India. Wherever he went he was accorded with the utmost piety and veneration by the people. Gurudev’s prathishta in April 1912 of the goddess Sree Sarada at Sivagiri, ranks as the most remarkable among his consecration of temple deities, and occupies a distinguished place in history. Foundation for it had been laid in 1909. The same year he composed the poem “Jananee Navarathna Manjari”. According to the Indian concept, the goddess Saraswathy is the prime goddess of knowledge. But there are very few temples in Kerala with Saraswathy prathishta. Sivagiri Sarada Mutt was planned and designed by Gurudev who took a particular interest in it. Ordinary temples do not have windows. 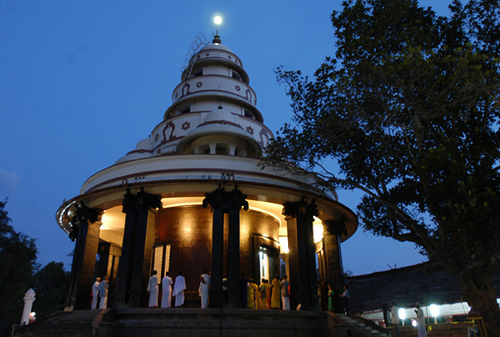 Gurudev called this temple, which is octagonal in shape, Sarada Mutt. Here unlike in other temples, there is no nivedyam (offering of food to the deity) or abhishekam (pouring oil, ghee and such on the idol). Devotees can worship the goddess by reciting hymns. The idol of Saraswathy seated on white lotus is the symbol of “knowledge blossoming on purity”. Gurudev performed the pratishta of the deity at Sarada Mutt on the full moon day in April 1912. In connection with that event, grand conferences and festivals were conducted for four consecutive days. Sree Narayana Guru introduced original and novel perceptions about temples, departing from traditional ideas on the subject. He shunned tantric rituals. There is no similar temple in India. “It is not necessary to build temples in the old style by spending a lot of money” he ordained. Further, he also advised not to spend money on festivals and fireworks. “In temples there should be spacious rooms where people can sit comfortably and take part in discourses. There must be schools attached to all temples. There should also be amenities attached to the temples to train children in various trades. The money that comes to the temples as donation must be spent in such a way that the poor people benefit from it. It is not desirable to make ponds near temples for the worshippers to take bath. It is not possible to keep the ponds always pure. Therefore bathrooms are to be constructed with an arrangement of small pipes so that the water will fall from above the head.” From these words we can clearly understand the progressive nature of Gurudev’s concept of the temple. The Sarada Consecration Committee had Dr Palpu as its president. Kumaran Asan was secretary.